The Community High Intensity Treatment Team (CHITT) at Providence Care provides recovery-oriented treatment, rehabilitation and support services for individuals who experience a serious mental illness and who require intensive services in order to maintain success in community living. Services are provided by an Interprofessional team which works collaboratively with individuals and their support systems to realize their personal recovery goals. CHIT Team clinicians include occupational therapists, nurses, social workers, administrative support as well as manager, Gord Unsworth and psychiatrist, Dr. Martin Feakins. Adam was diagnosed with a severe form of Schizophrenia as a teenager and for the past 8 years, he has been a client with the CHIT Team. The team works collaboratively with Adam and his parents to support Adam’s recovery and his participation in any activities that are important in his daily life. The team sees Adam twice daily for medication administration and supports other activities such as doctor’s appointments or grocery shopping trips. CHITT services have enabled Adam to remain independent, engage with community members and flourish. For Adam, church is an important activity. Recently, it was identified that more support was necessary in order for Adam to continue attending weekly church services. Dave Carmichael, an Occupational Therapist with the Providence Care CHIT Team, explains that key players started by asking “How can we best support Adam to attend church?” The idea of a support team at Trinity United Church quickly developed and the “A” Team (named by Adam’s Mother) was formed. This team of volunteers included Reverend Mark Arnill, Peggy and Charlie King (Adam’s parents), the Chair of Council at the Trinity United Church in Napanee and some Church members who had an interest in Adam’s wellbeing. 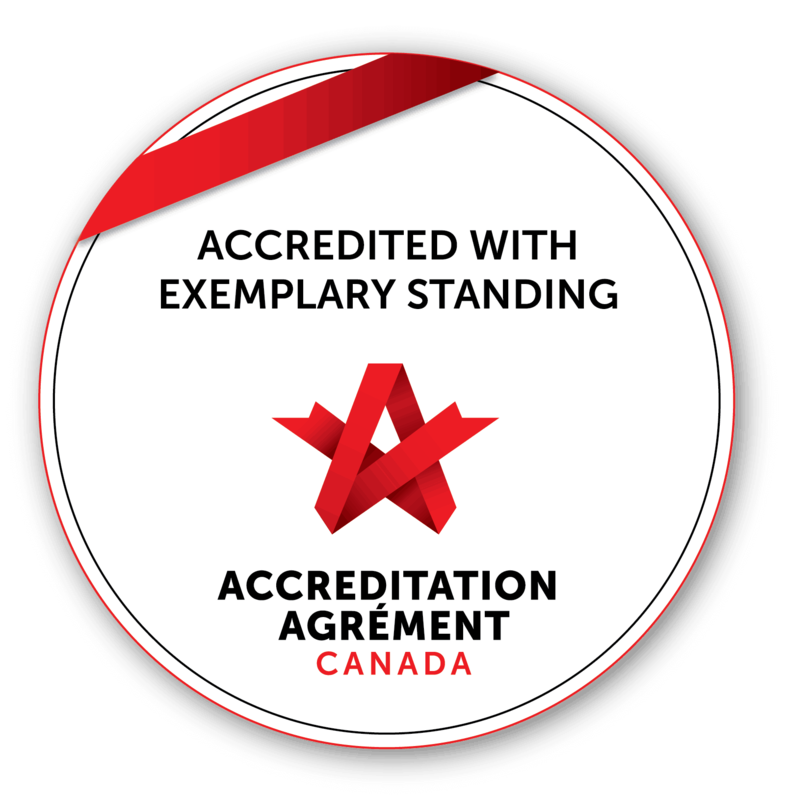 Dave Carmichael and Dustin Thatcher, a Queen’s University Occupational Therapy student who was doing an 8 week placement with Providence Care were also members of the “A” Team. “The team identified that they wanted everyone to have the same basis of knowledge and a shared understanding as to how to best support Adam”, explains Dustin. The “A” Team identified the need for education including the basics of the mental illness, how Adam presents and different interventions that can be used when symptoms are present. Dustin prepared the presentation and guided members of the ‘A’ team through the learning activity. 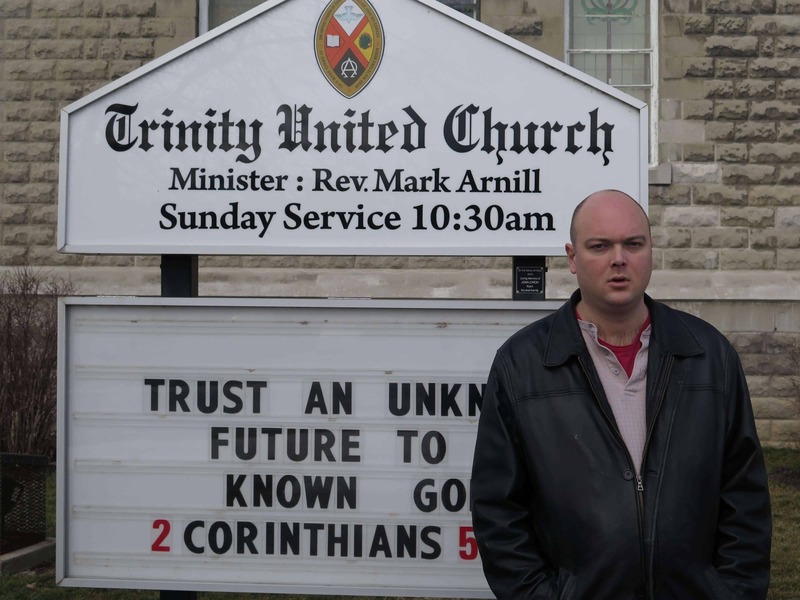 Reverend Mark, the Minister at Trinity United Church and a member of the “A” Team, identified his community’s responsibility to be open, welcoming and inclusive. “We wanted to work together as a unit, supporting and caring for each other”, says Reverend Mark. The A” Team considers that Adam is also a preferred customer at the Church. Everyone reaches out to ensure that Adam is comfortable and can attend church on a regular basis. The Governor General, His Excellency David Johnson and his wife, Her Excellency Sharon Johnson learned of Trinity United Church’s effort to accommodate Adam and Dustin’s lead role in preparing the “A’ Team during a visit to Providence Care in December. Adam’s parents, Peggy and Charlie King, were among a select group of people who met with the Governor General and spoke about their experience with the mental health system and the supports Providence Care has provided. The Governor General asked permission to share Adam and Dustin’s story to highlight mental health recovery and the role that community, health care providers and future health care professionals play in the process. Peggy and Charlie were delighted to share their story and felt that their voices were heard at the highest level of our government. They were impressed with the work that Their Excellencies do worldwide to remove stigma of mental illness. Living independently with the treatment, rehabilitation and support from the CHIT Team has been significant in Adam’s life and his recovery. However, the Team is clear that Adam has done the most work in this whole process. “The trials and tribulations that Adam has experienced have been endured with dignity” says Dr. Feakins. It certainly is clear that Adam is the star in this whole project and development of the “A” Team. “He was handed an extreme challenge in life and he has faced it head on. He really is a remarkable young man,” says Peggy King. We couldn’t agree more. Wonderful that Adam has such a good chain of people in his corner and they are all working hard with him to be a great asset to the community. Great Job! Well done A Team, Team Adam……Love, Support, Communication, and Empathy are needed! It is not easy to find solutions… you have to keep digging… and the Biggest…. Never, ever Give Up! Adam was a high school friend, a great guy with a great sense of humour. A lot of fun to be around. I’m so happy to see he’s been doing well and has a team of people who care about him and help everyone around him understand what he’s going through. Thank you! I knoow Peggy and Charlie…they are the salt of the earth!!! and Charlie does all that he can as does Peggy to ensure that Adam has all the help and guidance that he needs in this world…I know that Adams favorite place to eat is Swiss Chalet so Peggy makes sure he gets there every week.I am proud of CHARLIE AND Peggy …they are to be treasured and admired as parents…they have gone that “extra mile”.someday there will be a special place in Heaven for them for what they’ve done for Adam. We have to agree Joe. They are wonderful people! 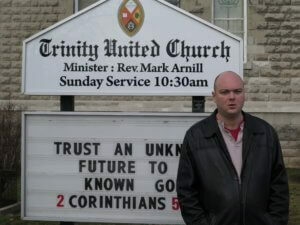 Big shout out to Mark Arnill at Trinity! When I was a Spiritual Health Practitioner at Providence Care I knew Adam and his strong faith. I tried to educate congregations about welcoming people with challenges. It was a hard sell, and so I am thrilled to hear this. To those on CHITT who go out of their way to enable a client to go to worship on a weekend, I really admire you. I’ll be sharing this post with my colleagues who are ministers. It’s a wonderful story isn’t it? We are blessed to have so many wonderful, caring staff and community members in our Providence Care family.